It’s that time of year once again. Exams are done, summer is on the way. All this can only mean one thing: Leavers is just around the corner. In fact, the week that every high school student looks forward to starts this coming Monday. It can be pretty daunting as a parent to send your child off on their first “grown up” holiday. There’s a lot to worry about. From things like injury or sickness, to trivial things, like making sure your child doesn’t spend five days eating nuggets. Luckily, the locations aren’t just hordes of teens running wild. There’s a few incredible organisations who head to leavers and make sure everything runs smoothly and safely. Red Frogs are one of the most well known of these organisations and have been providing support (and lollies) to leavers for over 20 years. 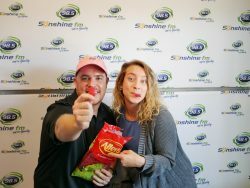 To give us the full rundown on what goes on at leavers, as well as some helpful strategies for both teens and parents, Red Frogs State Co-coordinator Hayden Glass joined Mel in the studio to chat all about the week ahead. Podcast: Mel chats to Hayden Glass from Red Frogs.